Dr. Griego was recently selected by SuperDoctors.com as a top Mohs skin cancer surgeon and dermatologist. Dr. Griego is a 14th-generation American whose ancestor, Juan Griego—a Greek, was among the original Spanish colonists who colonized New Mexico in 1598. He is a 3rd generation Arizonan who grew up in Scottsdale and graduated from Shadow Mountain High School. Dr. Griego studied biomedical engineering at Arizona State University where he was selected for membership into the National Engineering Honor Society, Tau Beta Pi. He then attended medical school at the University of Arizona, where he was inducted into the National Medical Honor Society, Alpha Omega Alpha, and graduated in the top 5% of his class. Dr. Griego also completed a one-year internship in Internal Medicine and a one-year fellowship in Dermatologic Research at the University of Arizona before performing three years of Dermatology residency at Baylor College of Medicine in Houston, Texas. Dr. Griego concluded his training with an intensive one-year fellowship in Mohs Micrographic and Dermatologic Surgery under one of the nation’s premier cutaneous oncologists, John A. Zitelli, M.D. in Pittsburgh, Pennsylvania. 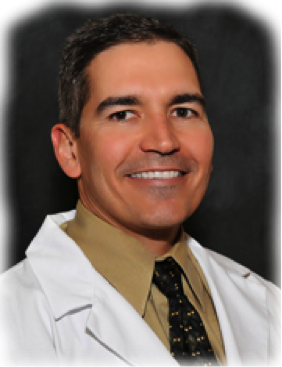 Dr. Griego is board certified by the American Board of Dermatology and is a fellow of the American College of Mohs Surgery. In addition to Mohs micrographic surgery, he has expertise in the areas of facial reconstruction after skin cancer removal. In order to provide the best service possible to those afflicted with skin cancer, Dr. Griego limits his practice to the treatment of malignant and some pre-malignant skin conditions, and does not provide general or cosmetic dermatologic services. Dr. Griego and his wife, Dr. Carole Bresnahan Griego M.D. who is a Pediatrician, have three wonderful children. In their free time the Griegos are likely to be found either enjoying the company of their extended family, here in The Valley, or in northern Arizona where the entire family can enjoy the beautiful outdoors of this wonderful state.